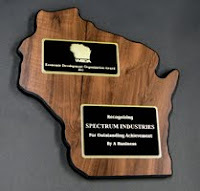 The Wisconsin Economic Development Association (WEDA) honored Spectrum Industries, Inc. yesterday with the Outstanding Achievement by a Business award. WEDA’s primary objective is to increase the effectiveness of individuals involved in the practice of economic development in Wisconsin by encouraging cooperation, exchange of information and promotion of professional skills. Spectrum, in turn, was honored for its innovation, its positive culture to facilitate employee development, and its dedication to community programs. “It is an honor to be recognized by WEDA for Outstanding Achievement by a Business. This award is a testimony of Spectrum strengths and values of providing innovative and high value products and services to customers, putting us on top of our industry market!” said Scott Dorn, Executive Vice President, Sales & Marketing at Spectrum Industries. Spectrum looks forward to continued growth, innovation, and community participation. Thank you to all our stakeholders for you continued support!